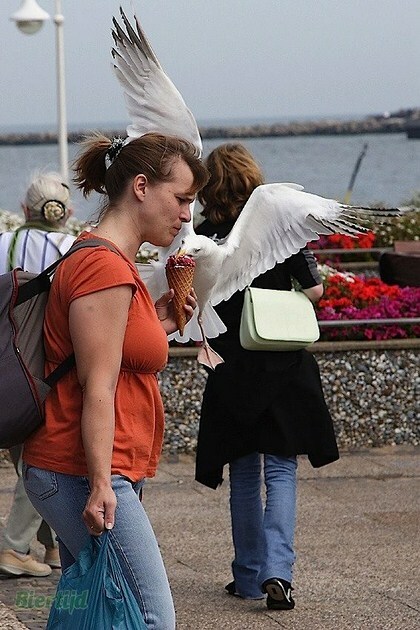 Maurading seagulls that are blighting Britain's seaside resorts are starting to get picky about the kind of ice cream they are willing to steal. 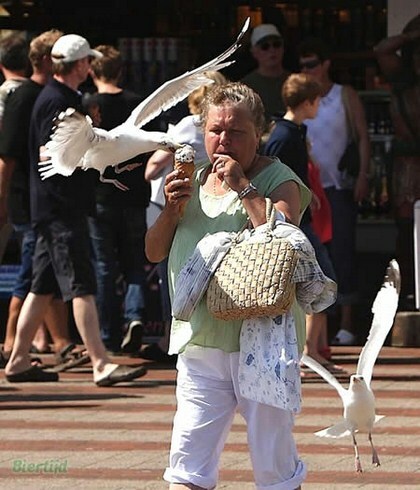 With their noisy calls and voracious appetite they are a distinctive feature of the British seaside. 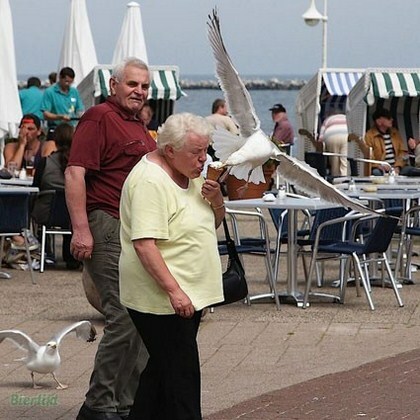 But relations between humans and seagulls are becoming fraught. 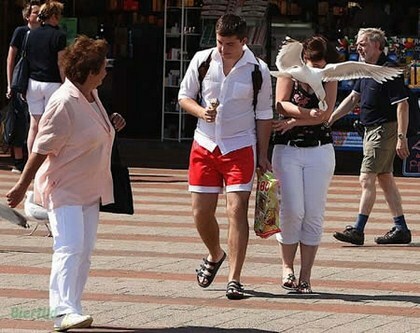 Holidaymakers have complained of being "mugged" by fearless seagulls stealing chips, sandwiches and ice cream. 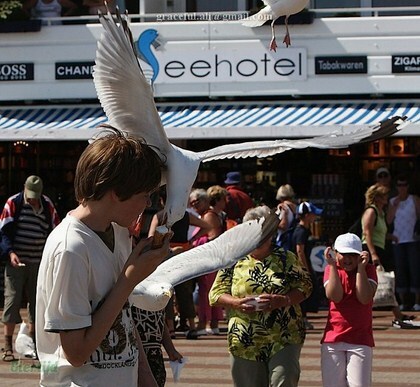 Resorts are considering ways to curb gull populations, including the use of squadrons of falcons and hawks. 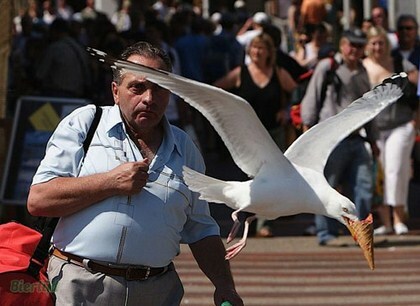 One council is imposing fines up to £2,500 on people caught feeding the birds. Sunbather Georgia Coops, 45, a gardener on holiday from London, reported that her son Oliver, 10, had had his ice cream stolen. 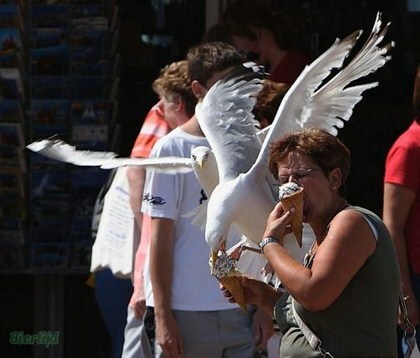 "It was a chocolate ice cream and he is convinced that they like those ones the best," she said. "We bring this tent to the beach so the kids can eat their food in it. 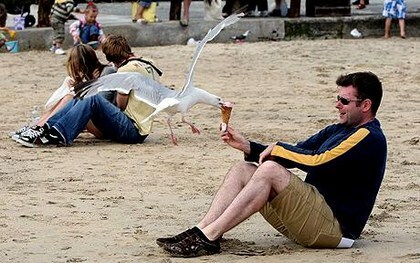 It's just too dangerous to sit outside and eat." This protective trait has been exploited for 10 years by Maria Chaffin, of Carbis Bay, near St Ives. 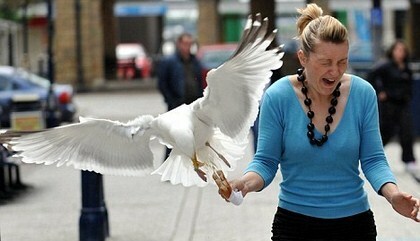 "We have had two seagulls, Simone and Garfunkel, for 10 years," she said. "We feed them so they keep the others away. 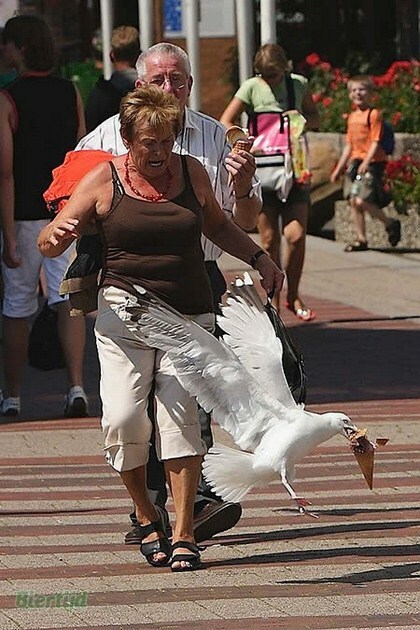 "They are very territorial and if other seagulls come on our roof, they are seen off in no uncertain terms. I think they are beautiful creatures." But others in St Ives, such as chef Michael Smith, who owns the Porthminster Beach Cafe, are less enamored. 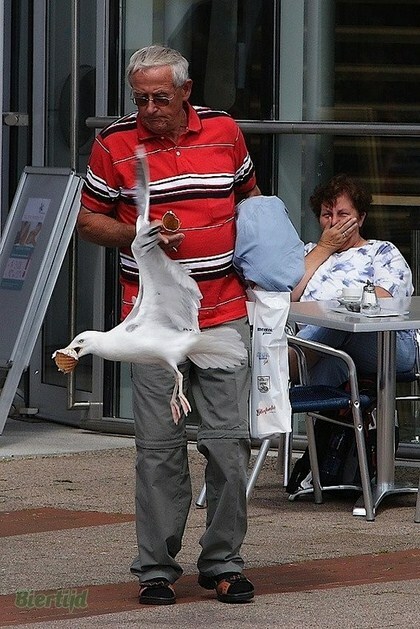 Mr. Smith estimated that up to £3,000-worth of food had been stolen from his roof terrace so far this year by gulls, which he said were "becoming more cunning and conniving". 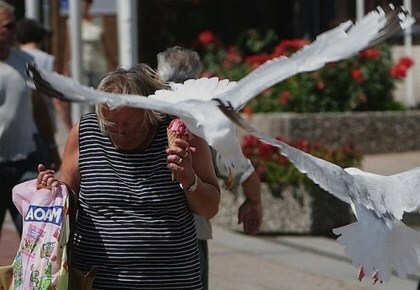 Under pressure from local businesses, St Ives town council has deployed birds of prey, which tend to scare off rather than kill seagulls. It has hired falconers at £1,000 a week and is now considering spending £6,000 to buy its own birds of prey. 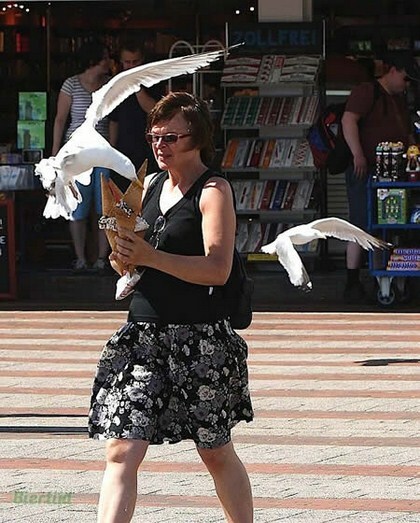 This could become a more widespread method of control, particularly if Natural England decides next year to remove herring gulls and black-backed gulls from a list of birds which can be culled under license, because of concern about the species' declining population levels. 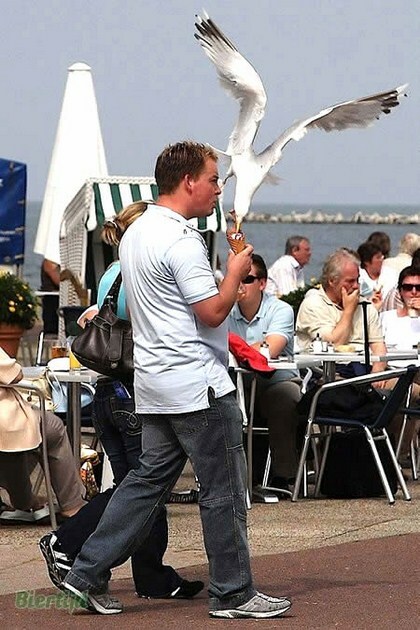 Expert Peter Rock, who became Britain's first full-time professional urban gull-watcher in 2002, said stealing food from humans was "a learned behavior" passed on from parents to offspring. "They do it terribly well in St Ives. They do it in Jersey, a little bit in North Wales and they do it in Torbay, but you don't see that in any other urban colonies," he said.